As a long standing educational institution, University of East London (UEL) understand the importance of allowing students’ to carefully research and explore the choices of courses available, ensuring they make make the right decision to start off their academic and career path. 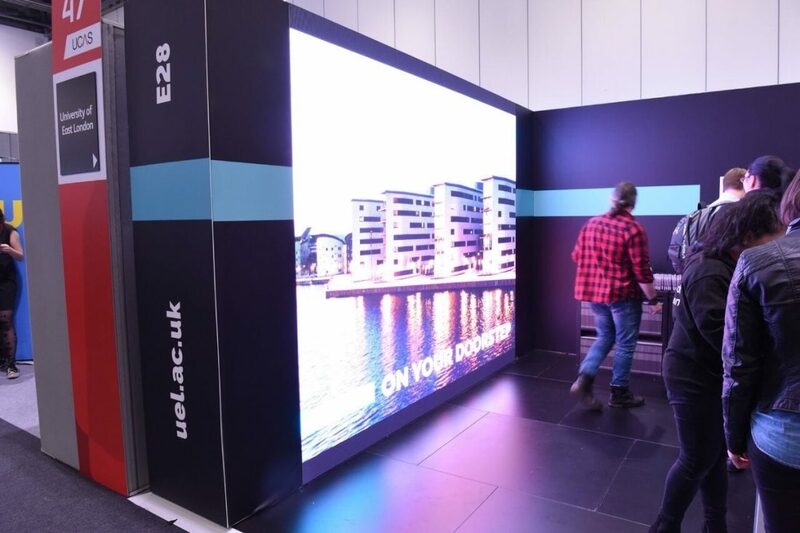 So when they wanted an exhibition stand at the UCAS event, held at the Excel centre in London, to showcase all the amazing courses and facilities available at UEL, our team were happy to help. The initial brief from the client was to set up the exhibition stand along with a LED screen to display the University’s promotional footage. Part of the assignment was to ensure maximum impact within a small footprint area. Our skilled LED technicians utilised the tension fabric as it allows for a crisp and an attention grabbing screen. Working in a 6 by 4 stand area, the LED wall was the best option for the clients’ needs. The depth of the LED wall at 62mm allowed for cutting edge technology to be implemented within the exhibition area without compromising on space. Pre-planning in our demo warehouse allowed our team to rehearse the set-up within the 2 hours given by the exhibition arena. As this was a strict requirement from the client, pre-planning allowed our team to know what they are up against and iron out any problems before the day of the set up, this ensures our client is left completely satisfied with the audio visual elements of their event. LED walls provide powerful imagery and for this exhibition it proved to be successful. The luminous screens attract attention and increase footfall, allowing the small space to accomplish impressive content. LED walls are the ideal solution for digital signage as the LED is actually producing the light rather than it being back-lit like a videowall. This means that the image is optimised to the highest quality, quintessential for an exhibition stand. If LED walls are what you require for your event, or you would be interested in some advice on how to implement it into your event, please call our team on 0207 701 9444 or email on info@londonaudiovisual.co.uk.